Now that there’s only a week left in 2014, I’d like to take a moment and let you know some of what’s going on behind the scenes, either with us or with Ocean Beach. The OB Planning Board needs you. First up, however, is a plea to get people to run for the OB Planning Board. Their election isn’t until March, but in order to be eligible to run as a candidate for one of the open seats, you must have been to at least one general meeting over the last year, and you need to have done this by February. There are 7 or 8 seats open this election, depending how you count. Their meetings are the first Wednesday of every month. So, first, if you are even vaguely interested, check to see which OB planning district you live in. There’s other things you’ve got to do to be eligible – like get signatures from residents or businesses in your district. The current Board only has two women right now, so women are encouraged to run, plus there’s a need to have more renters on the Board. Renters make up 6 out of every 7 OBceans and the Planning Board ought to reflect that ratio. Mission Valley destruction follow-up. I will be writing more on the destruction of Mission Valley, with a detailed report of each of the 4 large developments scheduled to be built. Meanwhile, we’ve generated some interest in Mission Valley by the Voice of San Diego where Matthew Hose expresses his concern about its traffic. Also of interest was veteran U-T writer Roger Showley’s piece last November about San Diego’s four historic land battles, one of which was Mission Valley. If you, dear reader, feel you have some insight or would like to share observations about Mission Valley, send me something in our email, obragblog@gmail.com . So, please watch for my part 2 coming soon. On a more random note, I’m doing some writing about the March 1971 “Collier Park Riot” and am looking for eyewitnesses to interview. If you were or know someone who was, please contact me via our email. Mural Design Contest for Newport & Abbott? We did a piece awhile back about a possible crosswalk or some type of pedestrian controls proposed for the elbow intersection of Newport Avenue and Abbott Street. We also ran a poll and found that a majority of our readers favored some kind of pedestrian control – but without lights – at the site. One of the design options includes a large mural in the middle of the intersection, something akin to what folks did up in PB. If I were you and you were a muralist or street artist, I’d be starting on my design for the possible proposed mural … now. Expect a real design contest coming. Point Lomans are asked to step-up. The OB Rag, has made a concerted effort to provide more news coverage of the communities around Ocean Beach, like Point Loma, the Midway and Mission Bay. But we need some help. We need help in getting our Peninsula readers to join us in providing news, tidbits, rumors, observations, art or photos bout Point Loma. We also need our Point Loma friends to step up in the donations section – we have scant resources, and if we’re going to continue this coverage we do need some help – coverage, by the way, that is not provided by anywhere or anyone else, such as reports of the Midway Planning Committee or of the Peninsula Community Planning Board. If you know someone who lives in Point Loma, send them a link or article from the OB Rag. And please join our OB supporters and make a small monthly donation via the PayPal on our homepage. Speaking of donors, here’s four. I’d like to share with you a little something about four of our donors. The first one lives in OB and sends us $10 a month through PayPal. We don’t know this person. But we do have about a dozen or more of such friends, and they send in from $5 to $20 on a regular basis – which is the bedrock of our support because we can count on it. We do have bills to pay and writers to pay and rent to pay. The second donor is named Eric and he lives in the Mid-West, and every now and then he sends us a small amount of cash stuffed in an envelop through our PO Box. Usually he also sends a hand-written letter giving us support or asking us to cover something. The third donor is Tom C who lives in rural northern California and who works for the post office. Tom C however used to work on the OB Rag when it was a newspaper back in the early 1970s, and was a local boy, having graduated from Pt Loma High in the late 1960s. He has family who still live on the Peninsula. Every season or so he sends us a check for $250. Our fourth donor, Robert E also worked on the OB Rag when it was a newspaper, and who had become the workhorse of the paper at its zenith, when it distributed 5,000 to 10,000 issus every 2 weeks. After moving away for decades, he returned to OB with his family and bought a house and settled in. He just sent us $300. These people are the supporters who keep us going, keep us inspired, and help us pay the bills. We thank them and all the others who sent us help with all of our hearts – and think you should thank them also – otherwise you may not be looking at this page but for them. While throwing out thanks, we also want to mention that the OB Rag has nominated Gretchen Newsom, president of the OB Town Council, to the San Diego Free Press’ “End of the Year” celebration of San Diegans ‘who made a difference’. It’s supposed to come out Wednesday in our online media partner. Happy Holidays to everyone and to all the OB organizations that also made a difference this year – the year the community came together around the Ocean Beach Community Plan, the OB Town Council, the OB Planning Board, the OB Historical Society, the Friends of the OB Library, the OB Woman’s Club, and of course, the OB Mainstreet Association. Frank and the OB Rag – thank you for nominating me as one of the many “People Who Made San Diego a Better Place in 2014.” I’m looking forward to another great year in 2015 with plenty of advocacy for Ocean Beach! Happy Holidays, and again – thank YOU! The world would be a much more beautiful place if we all sported beards like Frank’s. Actually had most of it cut off recently. Just the ‘stache now … but thanks. 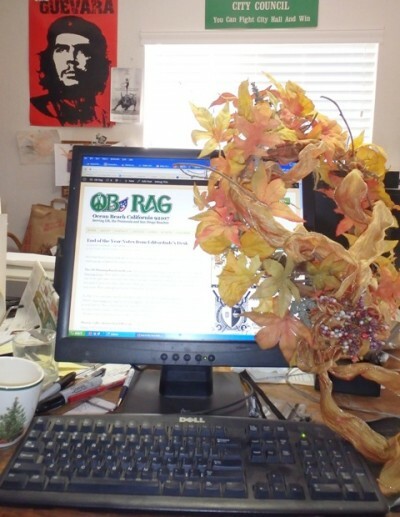 You know what’s on that wall of the OB Rag office? Ya gotta have a Che poster – any leftie media junkie has to have one of them; then there’s a green poster from my campaign for city council way back in 1987. (Sure I lost, but in OB I won, beating out Ron Roberts, Byron Wear, the trike guy, and everybody else – there were 12 candidates I think that year as there was no incumbent. I ended up with about 10% of the primary vote.) Finally, there’s a smaller 8 1/2 x 14 ” black & white poster from the Occupy Wallstreet movement.